With more than 5 Human Rights defenders killed each month so far in 2012, Colombia cannot say they no longer need the United Nations human rights offices. Brussels, July 19, 2013. In light of the announcement made by the government of Juan Manuel Santos that they will only extend the mandate of the UN Office of the High Commissioner for Human Rights (OHCHR) in Colombia until August 7, 2014, Oidhaco is asking for public support from European countries, recognising the importance of the work of this office. The OHCHR has been and is essential for monitoring and improving the situation of human rights and international humanitarian law in Colombia. This Office has supported civil society organisations, and has worked with the Colombian government to find adequate measures to improve difficult human rights situations in Colombia. Each year they have been able to expose within the UN Human Rights Council, the developments, challenges and difficulties for human rights in Colombia. In the Oidhaco European network we are concerned at statements made by President Santos, who has said that “Colombia has advanced far enough to say: ‘We no longer need the United Nations human rights offices in our country’”. In Colombia there are more than 5.7 million internally displaced persons, and each year this number increases by at least 200,000 people. The agency responsible for the coordination of Humanitarian Affairs – OCHA – warns of an increase in mass displacements in the first quarter of 2013 compared to the first quarter of 2012. The same applies to the plight of human rights defenders in Colombia: according to the Information System of Attacks on Human Rights Defenders in Colombia (SIADDHH), in 2011, 49 defenders were killed. In 2012, 69 were killed, 20 more than in 2011. This upward trend remains the same in 2013: during the first quarter of this year three more human rights defenders have been killed than during the same period in 2012. “With figures such as these, how can President Santos say that they no longer need United Nations human rights offices?” asks Oidhaco spokesperson Vincent Vallies, and he also remarks that, “this is without taking into account economic, social and cultural rights, such as for example the constant disrespect for the right of indigenous peoples to free, prior and informed consultation”. In the Universal Periodic Review (UPR) on Colombia in Geneva, held in April this year, the Santos administration, through its Vice President Angelino Garzón, testified before representatives from more than a hundred countries, that the mandate of the Office of the High Commissioner for Colombia would be renewed and would not change. 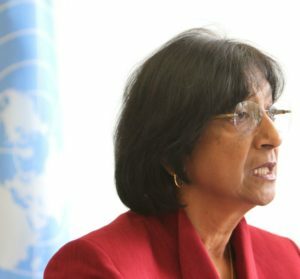 “We should not accept that a few months later, because of disagreements with statements from the Office regarding the risks of legislation on the extension of military jurisdiction, or on the critical situation in Catatumbo, they have changed their mind and acted differently to the announcement made in a space as important as the UPR” concludes Vincent Vallies. Oidhaco is asking the EU, its Member States, and Switzerland and Norway, to show their support for the Office of the United Nations High Commissioner in Colombia and to ask the government of Santos to renew its mandate in Colombia indefinitely.